From the inside, the COM103, AE50H, AE75H, PSR-250, PSR-275 and PRO-50 are almost identical. Modifying these scanners with a discriminator output is quite straightforward. They are a pre-SMD scanners. The receiver IC is a DIL type. The scanners contain an MC3361 or identical KA3361. 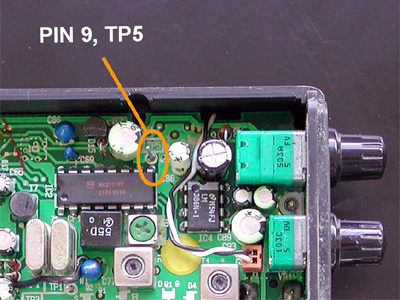 The unfiltered baseband signal can be found at pin 9 and at TP5 (test point 5) as well. TP5 is connected directly to pin 9. If you use TP5, you don't have to solder to the IC. A 10 k resistor is connected to TP5. Because the output signal contains a ligh IF component at 455 kHz, as usual with the MC3361, we construct a simple lowpass filter. The resistor's other lead is connected to a 2.2 nF capacitor. 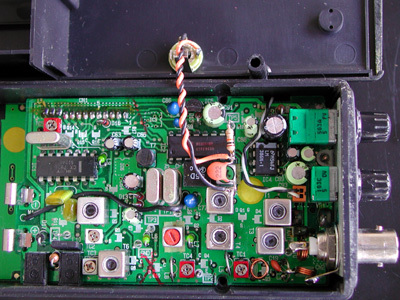 The other lead of the capacitor is connected to the scanner's ground. The metal shield of one of the coils can be used as ground. This filter effectively suppresses the 455 kHz signal, but leaves the data signal in which we are interested intact. A 3.5 mm chassis terminal is mounted in the back of the scanner. Because of the short distance between the terminal and the discriminator IC, insulated wire can be used. 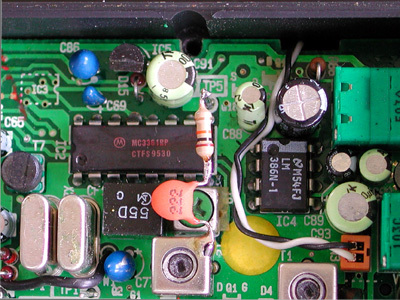 The joint of the 10 k resistor and the 2.2 nF capacitor is connected to the lug of the chasssis terminal that makes contact to the tip of an inserted 3.5 mm plug (orange wire). The other lug of the terminal is connected to ground, e.g. to the metal shield we used before (black wire).